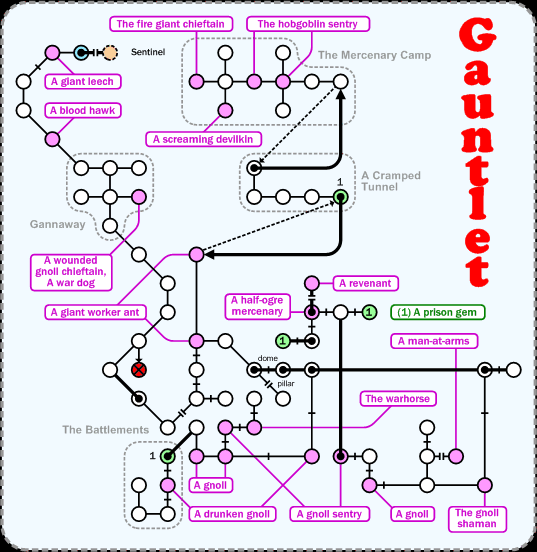 Gauntlet. An area exclusively for characters 20 and under, packed with great exp and fantastic levelling equipment. Accessible only via the Sentinel (area), with the Sentinel (item) to unlock the door. Walk 9w, 2nw, n, w, nw, w, nw, w, 2s, 2e, 2ne, e, ne, n, u, 2e, n, d, 3s, se, ne, n, open se, 2se, ne, open e, e, se, s, sw, s, sw, 2w, s, 4e, u, open e, e, d, w, unlock w, w, d to get from DH to the room marked in blue.